The CK-12 Foundation was founded with the mission to enable everyone to learn in his or her own way. We pair high quality content with the latest relevant technologies. We equip students, teachers, and parents with everything they need. For free. CK-12 uses a FlexBook® platform to allow for customization of content and focuses on Concept-Based Learning to allow students to access multiple methods for learning a particular topic. To help you get started with the CK-12 platform and fill in gaps in your knowledge, we are bringing our newly revised online training back this summer. Now in its second year, our summer training has more sessions, on more days, and at more times, so it’s as easy as can be. Join us for seven or more sessions to maximize your experience and become a CK-12 Certified Educator, or sign up for individual webinars to learn about a new topic as your schedule allows. We’ll be here throughout this program to help you transform your classroom to meet your students’ needs. During webinars, we’ll walk you through the process of accessing, customizing, creating, sharing, and assigning content, interactives, and practice with students. Webinars will be offered Monday through Thursday at 9:00 am and 3:00 pm PDT on various topics. Office hours are also available every Friday for more personalized learning. Plus, you can connect with others and get ideas for your class on the Jumpstart for Educators Forum in our Cafe. Post a question on the forum, see our help page, or email support@ck12.org. What’s involved in this program? All sessions offered are online webinars. There are no in-person sessions. In addition to these webinars, there will be office hours throughout the program, where you can sign up to speak with a CK-12 team member via a call or video conference. Users are encouraged to join the Jumpstart Forum in the CK-12 cafe to connect with other educators. Any questions posted there will also be addressed. How can I cancel or reschedule a session? Your reminder emails contain a link for cancellation, and you can always register for new sessions on our registration page. You can also email jumpstart@ck12.org if you need help with cancellations or registrations. Can I get professional development through my district for participating in the program? CK-12 will gladly provide documentation of your participation in any live webinar and any proof of content published on our site. Participants looking for this documentation should submit the matching Google Form for CK-12’s verification. How do I become CK-12 Certified? To become certified with CK-12, you need to attend 7 sessions (including the 2 required ones) and submit the matching assignments. If for some reason you can’t make one of the sessions you are registered for, we encourage you to register for a later offering of that session. However, you can miss a single live session and instead watch the recording, turn in the assignment, and still qualify for Certified Educator status. If you have questions about this process or issues meeting these requirements but still wish to become CK-12 Certified, please email jumpstart@ck12.org. What will I be able to do on CK-12 by the end of this program? Users will be able to navigate CK-12 resources, customize content, utilize interactives, assign resources, and track student progress. What can I do now to prepare for this program or extend my knowledge of CK-12? Explore CK-12’s resources through searching and browsing. Check out CK-12’s Help Center for general information. Join the Jumpstart Forum and connect with others in this program. Email support@ck12.org with any questions about using CK-12. Welcome to CK-12’s Certified Educator Program! Participants completing a CK-12 Certified Educator pathway need to join this introductory session to learn about program logistics and CK-12. Throughout this session, you’ll learn the CK-12 philosophy behind Concept-Based Learning and begin navigating this robust platform to find FlexBooks® and supporting modalities—reads, simulations, PLIX interactives, videos, assessment, real world applications, and more—to meet your needs. CK-12 Help Center: Where do I start? Whew! You’ve learned so much this summer and now it’s time to put it all together! Required for all participants becoming CK-12 Certified Educators, this session will include how everything fits together, both within the CK-12 platform and in using it in your class, school, or district. You’ll leave with the tools to implement CK-12 and the confidence that we are here to support you throughout the school year as well. If you’ve been thinking about using CK-12’s FlexBooks® in your school or district, this session will give you the tips and resources you need to get started. It will cover reasons for choosing CK-12, best practices for individual or team customization, and ways students and colleagues can access your book. Joined by special guests who’ve used CK-12 to localize content and enhance engagement, you’ll finish the session with a plan for implementation. For those who have never customized a FlexBook® on CK-12, this session will introduce you to our editing tool. It will cover finding content to fit your needs, whether adapting a CK-12 FlexBook® or customizing a user- created book from another school or district. You’ll learn how to search for content by region or standard, the basics of customization, and options for sharing and publishing a book. Hear from other users who have chosen to customize books and how that has brought relevance and more engagement to their classes. Making advanced edits to your FlexBook® doesn’t have to be time-consuming or intimidating, but it can make it more engrossing for students. With demonstrations on embedding images and multimedia, tips for adding section headers and page breaks, and guidance for using the math editor, you’ll feel confident in your ability to navigate the advanced features of the CK-12 editor. Additionally, this session will give ideas for going beyond basic editing to fully customizing a book to feel tailor-made for your school or district. CK-12 FlexBooks® are not static textbooks that live on dusty bookshelves or in heavy backpacks. Content comes alive as students access their customized FlexBook® from various devices, use CK-12 tools to keep on track with their class, and even highlight and take notes within their books. This session will also cover various strategies and ideas for using CK-12 FlexBooks® when teaching, as well as showing how other teachers have put them into action in their classes. In addition to CK-12’s Adaptive Practice, which adjusts to the skill level of each student, teachers can assign various modalities—from reads to videos to interactives. This session will go over the difference between study and class groups on CK-12, how to set up groups, assigning practice and tracking student progress, and using the Q&A feature of groups. It will also show the various question types through samples of CK-12’s Adaptive Practice and how students and teachers can access practice. CK-12 did the heavy lifting for you by creating 150,000+ adaptive practice questions, while giving you the ability to customize these questions and assign quizzes to your classes. This session will include an overview of the CK-12 reports feature that tracks student progress. Additionally, you will learn how to maximize the assignment feature by creating multi-concept assignments from within CK-12 groups. CK-12’s Adaptive Practice is not a simple worksheet for students to complete. Students can access practice from their phone or computer, fill in gaps from previously covered content, and complete work on their own schedule or based on due dates from their teacher. This session will cover teaching strategies to help differentiate student learning through CK-12’s Adaptive Practice or customized assignments. CK-12 integrates with many learning management systems and tools used in school systems today. Beyond single-sign-on with Clever and Classlink or simply sharing a URL, CK-12’s content and resources are already integrated in different ways with Edmodo, Canvas, Schoology, Google Classroom, and Blackboard. This session will help you understand what resources are available from CK-12 and how you can access them from within, or share them to, each environment. CK-12’s Simulations and PLIX (Play. Learn. Interact. eXplore.) connect science and math to real world concepts in a dynamic and interactive way. With over 120 Physics and Chemistry simulations and 1100 math and science PLIX complete with interactive environments and associated questions students can learn through exploration both in and out of class. In this session, you will learn about accessing CK-12 interactives, the different components included, and strategies for incorporating them into your class. Links to the archived videos for each webinar can be found here. 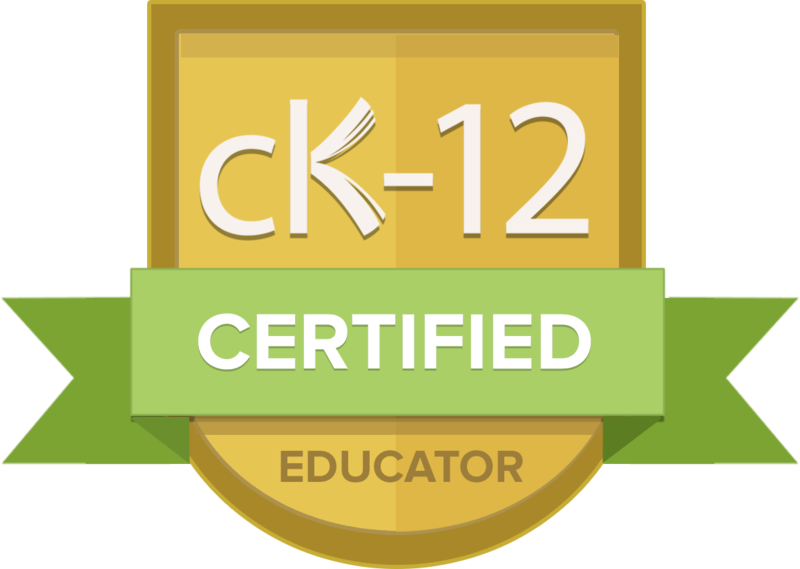 Welcome to CK-12 Certified Educator Program! Participants completing a CK-12 Certified Educator pathway need to join this introductory session to learn about program logistics and create learning goals. Throughout this session, you’ll learn CK-12’s philosophy behind Concept-Based Learning and begin navigating this robust platform to find FlexBooks® and supporting modalities—reads, simulations, PLIX interactives, videos, assessment, real world applications—to meet your needs. Whew! You’ve learned so much this summer and now it’s time to put it all together! Required for all participants becoming CK-12 Certified Educators, this session will include how everything fits together, both within the CK-12 platform and in your class, school, or district. You’ll leave with the tools to implement CK-12 and the confidence that we are here to support you throughout the school year as well. For those who have never customized a FlexBook® on CK-12, this session will introduce you to our editing tool. It will cover finding content to fit your needs, whether adapting a CK-12 FlexBook® or customizing a user-created book from another school or district. You’ll learn how to search for content by region or standard, the basics of customization, and options for sharing and publishing a book. Hear from other users who have chosen to customize books and how that has brought relevance and more engagement to their classes. Making advanced edits to your FlexBook® doesn’t have to be time-consuming or intimidating, but it can make it more engrossing for students. With demonstrations on embedding images and multimedia, tips for adding section headers and page breaks, and guidance for using the math editor, you’ll gain confidence in your ability to navigate the advanced features of the CK-12 editor. Additionally, this session will give ideas for going beyond basic editing to fully customizing a book to feel tailor-made for your school or district. CK-12 FlexBooks® are not static textbooks that live on dusty bookshelves or in heavy backpacks. Content comes alive as students access their customized FlexBook® from various devices, use CK-12 tools to keep on track with their class, and even highlight and take notes within their books. This session will also cover various strategies and ideas for using CK-12 FlexBooks® when teaching as well as showing how other teachers have put them into action in their classes. CK-12’s Simulations and PLIX (Play. Learn. Interact. eXplore.) connect science and math to real world concepts in a dynamic and interactive way. With over 120 Physics and Chemistry simulations and 1,100 math and science PLIX complete with interactive environments and associated questions, students can learn through exploration both within and outside of class. In this session, learn about accessing CK-12 interactives, the different components included, and strategies for incorporating them into your class. Take part in our discussions, ask questions, and share with others through the Jumpstart Forum on CK-12's Cafe and on social media. When requested, for each live session you attend, you will receive CK-12 documentation of your participation that you can share with your school or district. When you attend seven live sessions and complete the associated assignments, you will earn status as a "CK-12 Certified Educator". You may miss one live session and still receive Certified Educator status by watching the archived video and completing the matching assignment. We're here to help you as you learn more about CK-12 and the resources and tools we offer. Join CK-12 staff members online Fridays during this program to get individualized help. Check out our help desk for text and video tutorials on specific topics or email support@ck12.org with any questions. For help with rescheduling or questions about this program, email jumpstart@ck12.org. If you want to attend an additional webinar, you may register for any new session on this page.